← The Christian Faith from 90-150 A.D. The Renaissance was an intellectual revolution, a revival of interest in things concerning this life. Science, letters, original documents, painting, and other areas of human endeavors captured the imagination of Renaissance men. 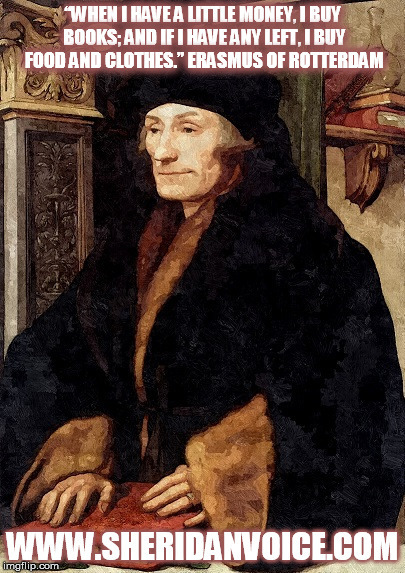 One of the greatest Northern Renaissance scholars of the sixteenth century was born on October 28, 1466, Erasmus of Rotterdam. Erasmus was a life-long student who traveled extensively living in places like Germany, England, Switzerland, France, and Italy. He was schooled in theology and became a priest, but he didn’t like the lifestyle. Erasmus corresponded with every thinker of his day and was friends with Pope Leo the Tenth, Emperor Charles the Fifth, as well as French and English leaders. Erasmus loved the classics and became famous for his writings. These include his famous Greek edition of the New Testament (see below), translations of the Greek classics and Church fathers, and one volume, “Praise of Folly,” in which he makes fun of medieval superstitions, ceremonial religiosity, and prejudices. Erasmus was a life-long Catholic who believed his church had become corrupted by superstitions and bad practices which were contrary to Scripture and he called for a return to primitive Christianity. Studying Church history, he saw that the faith had been distorted by the combination of politics and violent force, a church-state amalgamation which was the result of departing from the simplicity of the New Testament. Erasmus was a contemporary of the leading Protestant Reformers, but he never threw his hat in with them. He feared their course was leading to violence and revolution, which he wanted no part of. Catholic leaders asked him to defend Catholicism against the Protestants, but he refused. Erasmus seemed to stay on the sidelines when it came to this battle, because of which many have condemned him, I don’t. Erasmus’ New Testament, however, was invaluable to the Reformers. He believed the Latin Vulgate contained errors, so he published his Greek New Testament in 1516 hoping it would be translated into languages people could read. Erasmus saw his wish come true in his own lifetime as translators translated his text and the new Printing Presses spit out the copies which ended up in the hands of common people.